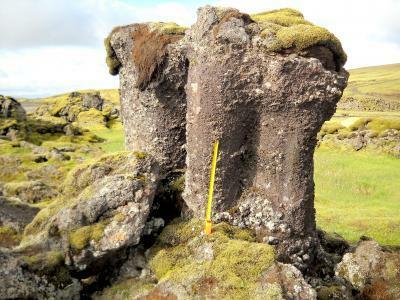 Rocky basalt pillars that litter Iceland's Skaelingar valley likely formed in a surprising reaction where lava met water - but without any explosion occurring. The authors of a new paper say that non-explosive lava–water interactions happened during the emplacement of the Laki lava flow in Iceland during 1783–1784. Skaelingar valley contains a tributary stream to the Skafta River. "Usually, when lava and water meet in aerial environments, the water instantly flashes to steam," said lead author Tracy Gregg, a University of Buffalo associate professor of geology. "That's a volume increase of eight times — boom. "Formations like the ones we see in Iceland are common in the ocean under two miles of water, where there's so much pressure that there's no explosion. They've never been described on land before, and it's important because it tells us that water and lava can come together on land and not explode. This has implications for the way we view volcanic risk." Deep-sea basalt pillars form when columns of super-heated water rise between pillows of lava on the ocean floor, cooling the molten rock into hollow, pipe-like minarets. The structures grow taller as lava levels rise, and remain standing even after volcanic eruptions end and lava levels fall again. 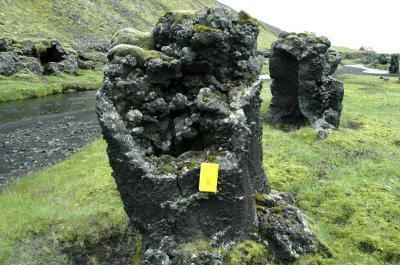 Gregg and co-author Kenneth Christle propose that the same phenomenon sculpted the land-based lava pillars in Iceland. It happened in the 1780s, when lava from a nearby eruption entered the Skaelingar valley, which Gregg theorizes was covered by a pond or was super-swampy. She thinks one reason no explosion occurred was because the lava was moving so slowly — centimeters per second — that it was able to react with the water in a "kinder, gentler" manner. "If you're driving your car at 5 miles per hour and you hit a stop sign, it's a lot different than if you hit that same stop sign at 40 miles an hour," she said. "There's a lot more energy that will be released." Their rocky exteriors bear vertical scars — scratches where pieces of floating crust may have rammed into the pillars and scraped the surface as lava levels in the valley declined. The skin of the towers isn't smooth, but gnarled with shiny drips of rock. 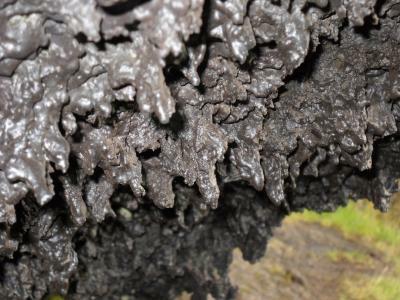 The glassy texture suggests that the lava hardened quickly into rock, at a pace consistent with non-explosive water-lava interactions. Had the lava cooled more slowly in air, it would have formed crystals. Each of these distinctive characteristics is also prevalent in deep-ocean pillars, said Gregg, who first saw the Icelandic formations in the mid-1990s while hiking in the valley with her husband. "I knew as soon as I saw them what they were," she said. "I had, at that time, been on submarine cruises and seen these things deep under the sea, so I was just hysterical, saying, 'Look at these!' So I ran around and started taking pictures until the light started running out." She didn't have the chance to return to the site until 2010, when Christle received a student research grant from the Geological Society of America to do field work in Iceland. The two spent four days studying the pillars in detail, confirming Gregg's original suspicions. In the future, scientists could hunt for land-based lava pillars near oceans to learn about the height of ancient seas, or search for such formations on Mars and other planets to determine where water once existed.